One thing that has been bugging me of late is how people interpret hadith to mean something completely different than what they actually mean. I talked about this a bit in regards to the famous hadith which, regarding prayer arrangements, says, "The better lines for the men are the front ones and the worse lines are the back ones; and the worse lines for the women are the front lines and the better ones are the front lines." The clear implication is that men and women can pray in any line, and indeed were praying in any line (if not why would there be a hadith addressing the topic). Yet, this hadith is used as proof that it is haram (forbidden) for women to pray in the front rows and men to pray in the back rows; or conversely, that women must pray in the back rows. As a general principle, in Islam when there are better or worse choices, the better choice may be ok, but the worse choices are still available to people. For instance, the Qur'an talks about women who are older not having to wear as modest a dress. It is better for them if they do, it says, but it is ok if they don't. It would seem the same principle would apply to prayer rows mentioned in the above hadith. Another hadith which has been interpreted oddly is the one which says that Paradise is at the feet of the mother. Many people have understood this to be praise of motherhood; that is, to mean that being a mother is exalted, and gets one paradise. But if you look at the hadith in its entirety, it's pretty obvious that it means that serving one's mother is a way into paradise. 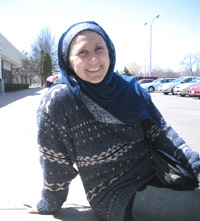 Given that modern, conservative Muslims have turned motherhood into near sainthood and have used these kinds of hadiths almost like shackles to insist that motherhood is the highest aim of a woman, this kind of misinterpretation has severe repercussions to the life choices of Muslim women all over the world. Contrast the claims that motherhood is the highest aspiration of the Muslim women to the classical position that carrying out the duties of motherhood is a right that cannot be taken away from women, but it is not a duty which they must carry out. Compare that to the Qur'anic verses which talk about sending your child to a wet nurse (a practice which the Prophet followed with his own son), vs the euphoria over the mother child bonding that we have today. Now, I happen to be a big proponent of mother-child bonding, but I also recognize that it doesn't have the holy status that some Muslims would like to ascribe to it. The upshot of such ascription is that women's agency, their ability to choose career over intense involvement with family, are circumscribed. Proper interpretation is sooo important! sis...the science of hadith explain how to determine the authenticity/context and interpretation of hadith, but I wanted to point out that hadith are interpreted according to what they meant in the Prophet sws's context, and we know that women prayed separately from men - they were separated by a curtain in the time of the Prophet sws, and the men did not see them. We have to acknowledge the way the companions of the Prophet sws and his wives implemented the hadith..
Women are like diamonds, and they are beautiful and a treasure and I think due to American culture and other cultures out there, women have inferiority complexes. In many instances we may not be able to see or understand the logic of a particular hadith. Does this mean we should discard it, take no heed of it, or turn a blinds eye to it? Of course not, instead, we should abide by it and make dua that Allah S.W.A. increase us in wisdom to understand it. In this instance one area of logic would be that because a person prostrate several times during prayer it would not be compatible with modesty for women to be in front of men or even lead the prayer when men are in the ranks. Always know that there is great wisdom, rational, and benefit in hadith (Sahih) even if we cannot glimpse it as yet.